It has been an absolutely manic couple of weeks. Between a few video shoots and travel for work, I haven’t had the energy or willpower to get into my kitchen to test any recipes (hello Menulog). But hey, life happens right? Time to get back on the band wagon! One of my bad habits, which mind you I am trying to break, is not eating enough fruits and veggies (I mean…wine counts as fruit juice right?). It’s always more convenient to grab a a chicken roll from the barbecue chicken shop or nuke some marinara sauce that you have tucked away in the freezer. So when I saw the large bag of carrots in the fridge I figure I should take advantage and use them up plus other ingredients I had lying around in the pantry. That’s when I found Baker by Nature’s Morning Glory muffin recipe on my Pinterest board. Watch my video on this recipe! Here’s Baker by Nature’s recipe. Line a muffin tin with paper liners and set aside. Preheat oven to 400 degrees (F) [200 degrees C]. In large bowl add the flours, sugar, baking powder, baking soda, cinnamon, ginger, and salt; whisk well to combine. Add in the applesauce, oil, apple and vanilla; whisk just until combined. Fold in the carrot, raisins, coconut and walnuts; stir until ingredients are combined. Divide batter evenly among prepared muffin cups. Bake at 400 degrees for 10 minutes, then reduce the heat to 350 degrees (180 degrees C) and bake for an additional 10 minutes, or until a toothpick inserted in the center comes out clean (or with just a few crumbs attached). Cool muffins in the pan for 5 minutes before transferring them to a wire rack. Serve warm, at room temperature, or chilled. If you watch my video, this recipe proves why I do two tests for each recipe. In the first test, the dough is really dry and the finished product is almost doesn’t resemble a muffin. The second test came out much better than the first. Overall, these muffins aren’t too bad. They’re incredibly moist and there’s a lot of different textures with the carrot, coconut and little bursts of sweetness from the raisins (or sultanas, whatever you want to call them). The one thing that might deter you from using this recipe is the amount of spices. You get this wash of cinnamon and ginger at the very end that can be pretty over powering for some, which is why I tried these bad boys out with only half the spice and it really made all the difference. All in all, I would give this recipe 4 out of 5 muffin tops. So if you like cinnamony things, this recipe is a keeper. If you’re not a huge fan, try my amended version below. It’s just as tasty! Line a muffin tin with paper liners and set aside. Preheat oven to 400F degrees, or 200C degrees. Bake at 400 degrees for 10 minutes, then reduce the heat to 350F degrees, or 180C degrees and bake for an additional 10 minutes, or until a toothpick inserted in the center comes out clean (or with just a few crumbs attached). Cool muffins in the pan for 5 minutes before transferring them to a wire rack. I have a bit of a sweet tooth and was craving cupcakes last week. These mini cakes can be a party in your mouth, or a heavy tasteless mess. For me, cupcakes are always best when homemade. I’ve never had a bakery cupcake that could top the fluffy goodness of a homemade cupcake. I already had my chocolate fix as Easter had just past, so something a bit refreshing but still sweet would do just the trick. That’s when I stumbled upon Cooking Classy’s lemon cupcakes with lemon buttercream. I never thought would say this, but these are sheer perfection. I’m serious. 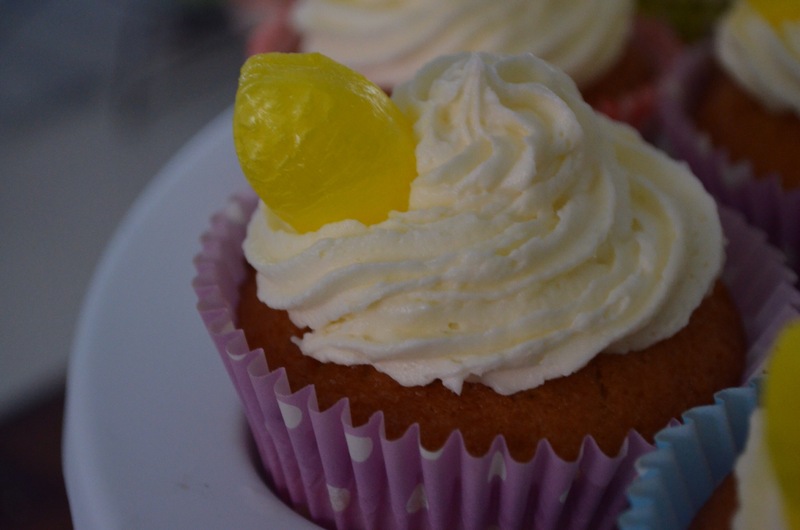 Screw the lemonade and make Cooking Classy’s lemon cupcakes with those lemons life gave you. Man, these do not disappoint! There’s absolutely nothing wrong with these cupcakes. Five stars (or lemons) all around! There’s just the perfect amount of lemon and sweetness in the cake and frosting. The batter is a beautiful light, fluffy, lemony goodness. If you’re like me and are a bit of a lemonhead, there is one additional thing you could do with these bad boys. If you can find it, use a corer to core the middle of the cupcake out. Wilton makes one of these corers, and you can find them at most cake decorating shops. They shouldn’t set you back more than a few bucks. Once you’ve cored the middle out, fill it to the top of the cupcake with lemon curd, jam, or whatever you want…even lollies! Once they’re filled, then top with the delicious frosting…..and then eat them to your heart’s content! Without further adue, here’s Cooking Classy’s perfect recipe! In the bowl of an electric stand mixer fitted with the paddle attachment, whip butter with lemon zest on medium-high speed until very pale and fluffy (it should be nearly white. If using a paddle attachment that doesn’t constantly scrape bowl while mixing, then stop mixer occasionally throughout entire mixing process and scrape down bottom and sides of bowl). Mix in 1 cup powdered sugar, then blend in lemon juice, cream, vanilla extract and lemon extract. Add remaining 1 1/2 cups powdered sugar, then whip mixture until very fluffy, about 4 – 5 minutes longer. Pipe or spread frosting over cupcakes. Decorate with lemon slices or lemon drop candies and mint leaves if desired. Store in an airtight container.